But one of the biggest challenges that humans face during the zombie apocalypse is how to stay alive without with our humanity still intact. The zombie apocalypse forces us to make extreme decisions that test the very limits of human morals and ethics. 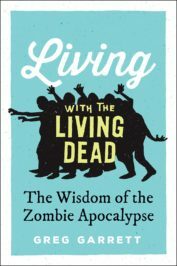 Watch the video below to hear Greg Garrett, author of Living with the Living Dead, discuss the morality complications of the zombie apocalypse. Then take our quiz to find out if you would survive the zombie apocalypse yourself. Featured image credit: “graveyard-graves-tree-spooky-night” by Skitterphoto. CC0 via Pixabay. Greg Garrett is Professor of English at Baylor University, where he teaches classes in fiction and screenwriting, literature, film and popular culture, and theology. Dr. Garrett is also Theologian in Residence at the American Cathedral in Paris and a licensed lay preacher in the Episcopal Church. The author or co-author of twenty books of fiction, nonfiction, and memoir, Dr. Garrett is (according to BBC Radio), one of America's leading voices on religion and culture, and a frequent speaker and media guest on narrative, religion, politics, literature, and pop culture. He is most recently the author of Living with the Living Dead: The Wisdom of the Zombie Apocalypse. Rebekah Edwards is a Publicity and Trade Marketing intern at Oxford University Press.